Jason Hite and Eryn Murman in "The Snow Queen." Photo by Haddon Kime. Based on Hans Christian Andersen’s tale, The Snow Queen is like Frozen by way of Gogol Bordello. With a superb mise-en-scene by director Rick Lombardo (who also served as choreographer) the show plays out like a campfire story as we meet Gerda (Eryn Murman) and her friend Kai (John Michael Presney) who are listening to the tale of the title character and how those who receive three of her kisses are never seen again. One day Kai sees the Queen (Jane Pfitsch) and becomes so enamored with her that he follows her all the way to her castle where she kisses him and turns him into her slave, forcing him to solve an impossible puzzle. Determined to rescue her friend before it’s too late, Gerda leaves on an epic journey that will have her meet witches, princesses and magical reindeers. With a book by Kirsten Brandt & Lombardo, music by Haddon Kime and Lyrics by Brandt, Kime & Lombardo, The Snow Queen is an entertaining show that has fun bending the conventions of how fairy tales are traditionally told in musical theater. Several cast members play their own instruments often giving the illusion that we are in a strange rock concert hosted in a magical land, and we can see how the creators tried to infuse their musical with experimental touches (it’s only until the second to last song in the first act that the show feels like a good old fashioned showtunes musical). Most admirable of all is the energy with which the ensemble approaches the material, which at times becomes so over the top that it borders on self-parody. But the show is so sincere with its intentions that you can’t help but root for Gerda and Kai, especially when they are played with such devotion by Murman and Presney who are terrific. However, the show shines when the supporting players take over, especially Reggie D. White, Jason Hite and Lauren Cipoletti who play everything from flowers to talking crows. It’s also important to point out how smart The Snow Queen is when it comes to sexuality. The show, while seemingly addressed at children, is rooted in the darker nature of the German fairy tales which served as warnings and camouflaged life lessons. In this case, with endless nods to engaging in sexual practices, the lesson at the center of the show is to not let ourselves be seduced by mere carnal desire, even if they make some body parts turn blue as Kai expresses. The lesson however is delivered with such non-judgmental qualities that this feels like an essential family experience. The kids might miss out on some of the double entendres, but will leave the theater singing songs that one day might click with them. 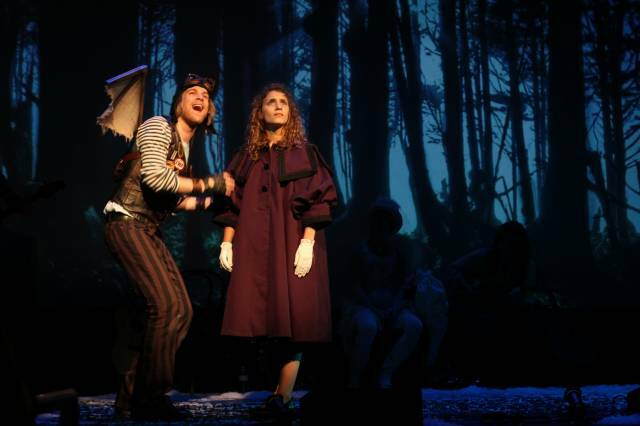 The Snow Queen is playing as part of the New York Musical Theatre Festival. For more on NYMF productions, click here. Through July 20 at The Alice Griffin Jewel Box Theatre.